Cary Pederson has an extensive career of both performance and education. 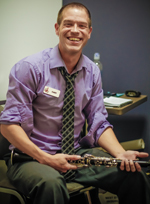 Earning both a Masters and Bachelors of Music Performance at Portland State University, Cary has been instructing the woodwind family of instruments for well over a decade. He started off instructing as a guest for Discovery Middle School in Vancouver, with Kathy Vogt. From there he branched off to local high schools. Cary, while working as a teaching assistant for Portland State University (PSU), became the woodwind pedagogy instructor, as well as, conductor for the PSU chamber wind ensemble and the music librarian. During his graduate studies at PSU, Mr. Pederson became involved with trumpet pedagogy, thanks in large part to his brother Cory (Jewell, Oregon public school district music instructor). Cary is also the director of the Beacock Music Concert and Swing Band who perform at various venues throughout the Vancouver/Portland metro area. His interests are classical and jazz compositions, as well as, music history and theory. Cary’s ultimate love is the clarinet (22 years) and the saxophone (18 years). Cary has studied with Kathy Vogt (Vancouver, WA public school music director), Dale Beacock (founder of Beacock Music), Dr. Stan Stanford (retired Prof. of clarinet at PSU), Dr. William Tuttle (former PSU wind ensemble director of bands), Juan Gregorio (former principle clarinetist of the Hawaiian Symphony), Doug Schneider (PSU piano/sax studies), Yoshi (principle clarinetist of the Oregon Symphony), Todd Kuntz (clarinetist for the Oregon Symphony), Dr. Denise Grant (former director of bands at PSU), and David Shifrin (American classical clarinetist). Recent performances include soloist for the Hood River Symphony Orchestra; NYC comic strip producer Shannon Wheeler’s “Too Much Coffee Man;” Oregon Symphonic Band; Oregon Jazz and Wine Festival; Portland State University Opera Productions; North Coast Community Symphony; and the Vancouver Pops Symphony. If you have a question for Cary, or wish to contact him, please fill out the form below. The message will be passed along to the Education Center and they will get back to you.